Plan to join the fun next Tuesday, March 26, as we celebrate the 2nd Annual ASE Member Appreciation Day. Throughout the day, we will be sharing the top reasons why we love our members on Twitter and Facebook. Follow along on Twitter @ASE360 and on Facebook @ASEcho. You can also follow #HeartofASE and #ASEMemberDay. 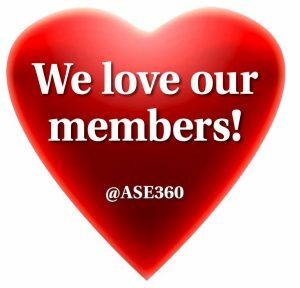 We would also like to encourage you to join in the fun and share your reasons why you appreciate your fellow ASE Members. Were they a fantastic mentor, teacher, speaker, or co-worker? Whatever the reason, just print this sign, take your picture, and tag us in your post. Thank you for being a member of ASE. Our community of members is strong, vital, and impactful. You are changing the world by improving patient care! We look forward to being of service in the year ahead.